Duns travelled to Livingston for their fifth game in Tennent’s East League 1, with injuries, work commitments and suspension necessitating several changes from the hefty victory the previous week. There was a strong wind blowing down the park and Livingston elected to play with that advantage in the first half. Duns started brightly but the home number 10 used the gale to good effect and had the visitors scrambling in defence. Livingston plugged away with their heavy forwards but could not break down the solid Dingers defence. The referee would blow up for a penalty at almost every breakdown, but still the home side could not open the scoring. 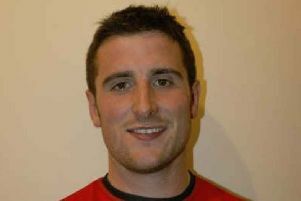 The official warned the captains regarding the amount of penalties and Richard Hume was the next to offend with a high tackle and was shown the yellow card. Livingston eventually put points on the board just before Hume’s return with a converted try. Late in the half David Hutchison had a try saving tackle inches from his own line. The travelling support would have taken 7-0 at the break but from deep inside the 22 Mark Alexander broke free, the ball was recycled left and Ryan Burns scored a terrific try, the wind too strong for Keiran Wilkinson to convert, and Duns were only two points behind at half time. The second half was all Duns, Livingston barely got out of their own half for the 40 minutes. 10 minutes in Duns took the lead, following a quick tap penalty deep inside the Livingston 22, Fergus Thomson carried then offloaded to Richard Hume to crash over, Wilkinson pulled the conversion wide. Keiran Wilkinson got lucky third time with the boot to convert a penalty to push his side’s advantage to six points. Not a high scoring game at 13-7. but four league points for Duns. 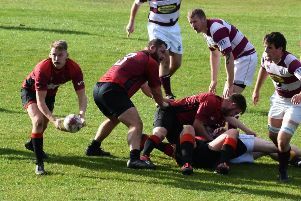 Next week Duns are at home to Linlithgow, kick off is 3pm at Castle Park.